A graft of the Hovell Tree in Albury commemorates the Hume and Hovell expedition. The Hovell Tree has been through some trying times. To prevent its death Albury City Council (ACC) successfully treated the tree with techniques to improve its health. ACC then commissioned the grafting of cuttings of the Hovell Tree onto River Red Gum root stock to essentially clone the tree and ensure its genetics are preserved for many years to come. To celebrate the success of this project, Albury City Council donated some of the cloned Hovell Trees to Councils along the Hume Freeway to commemorate this piece of Australian history. Captain William Hovell carved his name and date (17 November 1824) into the solid wood of a River Red Gum to signify the first sighting of the Murray River by Europeans. This tree later became known as the Hovell Tree and now commemorates this epic journey. His mission, along with Australian born bushman Hamilton Hume, was to find an overland route from Gunning, New South Wales to Westernport, Victoria. The expedition started in Gunning 17 October 1824, reaching Point Wilson (slightly off Course) 16 December 1824 and returned to Gunning 16 January 1825. 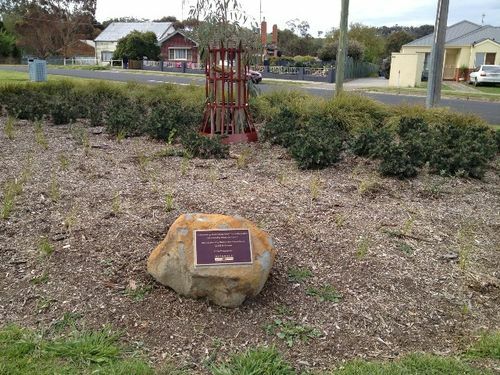 This tree was grafted from the Hovell Tree in Albury, NSW and donated by Albury City Council.